Brazil's President Jair Bolsonaro is in semi-intensive care following surgery last week to reverse a colostomy performed after he was stabbed on the campaign trail last year. Doctors had drained an accumulation of liquid in the area where the colostomy bag was removed, his spokesman said. 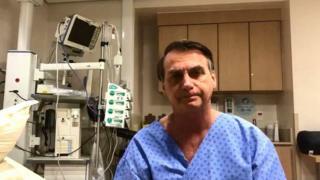 Mr Bolsonaro has no fever or pain but will now not leave hospital before Monday of next week, he added. Mr Bolsonaro took office as the country's new president on 1 January. He has been given antibiotics, and he is continuing to perform breathing and muscle-strengthening exercises in his bedroom, his doctors said in a medical report posted online. The 63-year-old president checked into São Paulo's Hospital Israelita Albert Einstein on 27 January in preparation for surgery. He had been expected to make a full recovery, and to leave hospital after 10 days. Earlier on Monday, Mr Bolsonaro posted a video of himself doing physiotherapy exercises in bed. A colostomy bag is a small pouch used to collect waste from the body when the digestive system is no longer functioning a result of an illness, injury or other problem.